The Columbus-Franklin County Finance Authority announced today that it was awarded the Council of Development Finance Agencies’ (CDFA) Distinguished Development Finance Project Award. 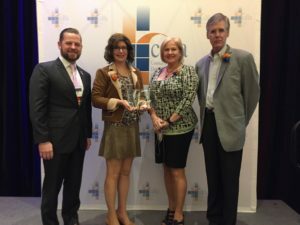 The award also recognized the City of Dublin, Summit County’s Development Finance Authority and the Toledo-Lucas County Port Authority for their partnership on the Bridge Park parking garage project in Dublin, Ohio. The CDFA Excellence Award recognizes outstanding development finance programs, agencies, leaders and projects, honoring excellence in the use of financing tools for economic development, as well as individuals who champion these efforts. Bridge Park, a $500 million public-private project, is a walkable, urban community in the heart of Dublin’s Bridge Street District. The development includes more than one million square feet of mixed-use office, retail, restaurant and housing developed by Dublin-based developer Crawford Hoying. The Finance Authority has been working with Crawford Hoying on this multiphase project since 2015 issuing over $280 million in bonds. About the Columbus-Franklin County Finance Authority: The Columbus-Franklin County Finance Authority is a public agency designed to facilitate capital investments by the private, non-profit and public sectors in Central Ohio. The Finance Authority is an eligible issuer of tax-exempt and taxable debt. The Finance Authority works in partnership with traditional lending institutions and other public partners, acting as a valuable resource for your financing options. The Finance Authority has issued more than $1.7 billion in bond financing in Central Ohio.